ELECTRONIC tag identification of saleyard lambs in Victoria should make it possible for processors to give carcase feedback, the It’s Ewe Time forum in Hamilton heard yesterday. Forum speaker and national manager of the Sheep CRC’s meat science program, Dr David Pethick from Murdoch University, conceded to Bulart prime lamb producer Gary Wake that current lamb eating research is aimed at producers consigning lambs direct to abattoirs. “I’m happy to go and burn the saleyards number one. “But you’re right, we do need systems that allow information to flow through a saleyard and back out and I would fully support that,” Dr Pethick said. Mr Wake said it was unfortunate that all of Dr Pethick’s eating quality research was directed at people selling lambs direct to works. Mr Wake said unless electronic identification can be introduced across the nation, Dr Pethick’s research is only going to benefit producers selling lambs direct to works. He said somehow sheep meat eating quality feedback has to be made available to producers who support the saleyard system. Dr Pethick is well-known as a supporter of producers consigning lambs to abattoirs as his “first option” to maximise eating quality, rather than selling through saleyards. “If it’s a clean deal where farmers put the lambs into a saleyard and they’ve got the electronic tag, then they go to a processor and the processor reads them, it should be an easy deal, shouldn’t it? “It’s not that different to direct selling, unless someone has bought them in the middle, then it’s different,” he said. “It should be possible, it shouldn’t be that difficult should it? Not really. “But as soon as they are sold to a third party and then go on to be processed, that’s different, because the next bloke now owns them and there has got to be an agreement then to do it,” he said. He also supported full Livestock Data Link feedback going back to saleyard lamb sellers, if it can be linked to lamb sellers/owners. “I would support any feedback, as a holy grail. 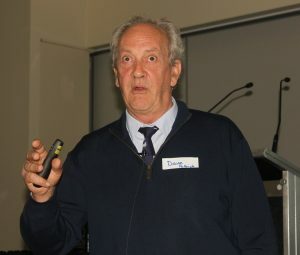 During his presentation Dr Pethick offered a “word of caution” to producers on industry sheep meat processing capacity. “The depressing thing is that there has been about a near-on 40 percent decrease in processing capacity on the eastern seaboard. “It’s a bit of a worry – a 40pc decline in capacity,” he said. “Plant closures, changes in shifts, things like that, that’s about the estimate of the number of hooks that have dropped out of the system. He said depending on seasonal conditions and other factors, but there could be a lot of pressure on killing space this season. “And that might mean some pressure on price, “I’ve got no idea, I’m just being honest about what might happen based on that 40pc lack of processing capacity. Dr Pethick later said he was talking about the number of hooks being used for sheep and lambs in plants and the number potentially available, which has been affected by plant closures. “I’m talking about both, plants have been closed and the problem is some plants have changed the size of their shifts; so both will have an impact. “If you are not doing a double shift that is less hooks, so it’s both, but I don’t know the breakdown of that precise level,” he said. Dr Pethick later said there was a “yin-yang” relationship between producers and processors. Dr Pethick said the processors are currently doing it hard in terms of profitability of their plants. More than 100 sheep producers attended the forum, which was an initiative of the Making More From Sheep program, funded by Australian Wool Innovation, Meat & Livestock Australia and the WA Department of Primary Industries and Regional Development.